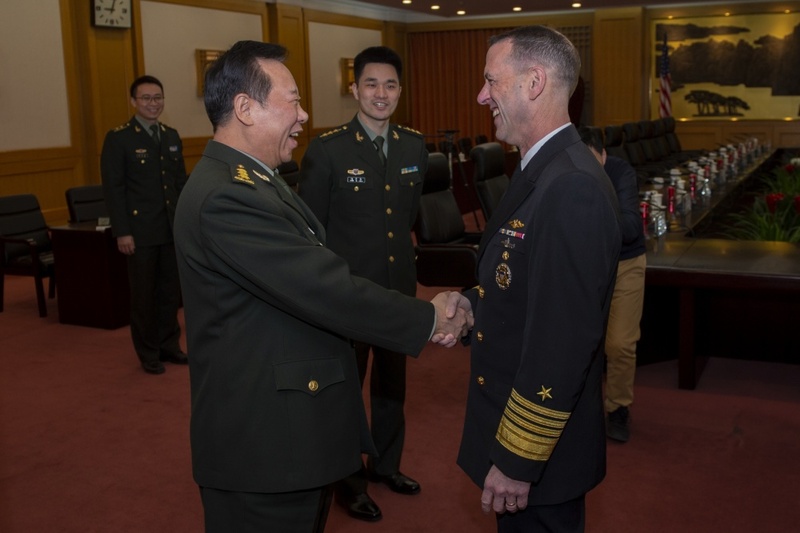 Chief of Naval Operations (CNO) Adm. John Richardson meets with Chief of Staff of the Joint Staff Department under China’s Central Military Commission (CMC) Gen. Li Zuocheng and other senior Chinese defense officials in Beijing on Jan. 15, 2019. Navy photo. THE PENTAGON – Maintaining a consistent presence is the key to dealing with China on the high seas, Chief of Naval Operations Adm. John Richardson told reporters. Given the frequent pace of U.S. Navy innocent passage and freedom of navigation operations in the South China Sea lately, Richardson said the best way to reduce the chance China’s leadership miscalculates when developing a response is to continue consistent operations in the region. Richardson used the word “consistent” more than a dozen times during his briefing. During a half-hour briefing with the Pentagon press corps Friday morning, Richardson provided highlights from his recent around-the-world trip that included stops in China, Japan, USS John C. Stennis (CVN-74), and Rota, Spain. However, Richardson focused much of his remarks on his meetings with his Chinese counterparts in Beijing. The Navy routinely sails past islands China claims as part of its territorial waters. Some of these claims include land masses not recognized by international law as an island. Other claims are considered by international law as being excessive. Among China’s claims, Taiwan perhaps provides the most significant chance for a military interaction to escalate quickly. China maintains Taiwan is not independent but rather is part of the mainland nation. In a claim not recognized by international law, China also considers the roughly 110-mile wide Taiwan Strait as part of its territorial waters. General Li Zuocheng, a member of China’s Central Military Commission (CMC) and Chief of the CMC Joint Staff Department, provided Richardson with China’s vision for Taiwan, according to the China Ministry of National Defense’s official account of Richardson’s visit. “General Li Zuocheng stressed that Taiwan issue is China’s internal affair, bears on China’s core interests and the national feelings of the Chinese people, and allows no external interference. If someone tries to split Taiwan from China, the Chinese military will do whatever it takes to safeguard national reunification, national sovereignty and territorial integrity,” stated the Ministry of National Defense official English-language translation meeting description. During the Friday briefing, Richardson relayed what he told his Chinese counterparts, which was that the U.S. Navy’s official policy toward Taiwan remains unchanged. U.S. policy does not dispute China’s claim to Taiwan. However, in keeping with international maritime law but contrary to China’s stated policy, the U.S. Navy does not seek permission nor provide Beijing with advance notice of Taiwan Strait transits. A week after Richardson’s visit to Beijing, Arleigh Burke-class guided-missile destroyer USS McCampbell (DDG-85) and Henry Kaiser-class oiler USNS Walter S. Diehl (T-AO-193) steamed through the Taiwan Strait. This was the third such transit in the past four months.